The Event Horizon Telescope (EHT) was used to create an image of Messier 87*, a supermassive black hole in the Messier 87 galaxy. This result has been heavily reported in the media leading up to its announcement 2019-04-10. Recent postings on social media have argued over who should receive credit for this work. Some have credited Katie Bouman for the image, which others have contested as overstating her contributions to the overall project. 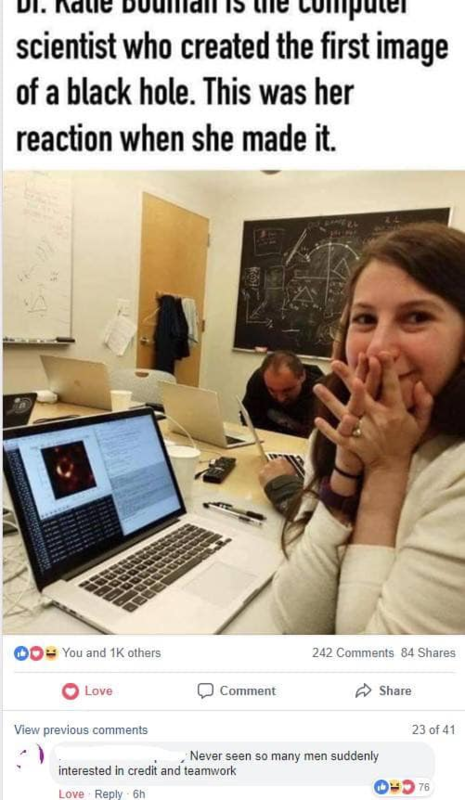 According to data provided publicly by GitHub, Bouman made 2,410 contributions to the over 900,000 lines of code required to create the first-of-its-kind black hole image, or 0.26 per cent. Bouman’s contributions also occurred toward the end of the work on the code.In contrast, contributor Andrew Chael wrote over 850,000 lines of code. While CNN attempted to give Bouman full credit, explaining “That’s where Bouman’s algorithm — along with several others — came in,” they slyly admitted that fellow researchers told CNN “‘(Bouman) was a major part of one of the imaging subteams,'” even after CNN incorrectly wrote on the previous line that she was on one of the “imaging teams,” not subteams. This analysis seems to disregard the way collaborative scientific research actually works; are the metrics being discussed sufficient to measure this kind of contribution, or the impact someone has on a project of this nature? The old title asked "Did researcher Katie Bouman only contribute 0.26% of code that created Black Hole image," and the existing answers do a good job explaining why it isn't true and why lines of code aren't a useful metric. The new title, however, asks "Was credit for the black hole image misappropriated?" and the correct answer should appear rather differently. On the one hand, we know that Bouman deserves a large share of credit. "(Bouman) was a major part of one of the imaging subteams," said Vincent Fish, a research scientist at MIT's Haystack Observatory. For the past few years, Bouman directed the verification of images and selection of imaging parameters. "We developed ways to generate synthetic data and used different algorithms and tested blindly to see if we can recover an image," she told CNN. "We didn't want to just develop one algorithm. We wanted to develop many different algorithms that all have different assumptions built into them. If all of them recover the same general structure, then that builds your confidence." That's where Bouman's algorithm -- along with several others -- came in. Using imaging algorithms like Bouman's, researchers created three scripted code pipelines to piece together the picture. However, Bouman does not deserve all of the credit. So, for the claim to be true, we would need to see that journalists claimed that she deserves all of the credit. CNN's headline is sufficiently reserved and the article goes far in explaining Bouman's work. However, BBC News was rather more sensational. However, as CNN explained above, multiple algorithms were used. So, I can see evidence for the claim that credit was misappropriated by some publications. Off topic: I find it rather unfortunate, too, since clickbait headlines and claims drive societal schisms. The primary reason the metric is meaningless is that Dr. Bouman is credited with developing an algorithm not with typing lines of code, so any metric measuring code production is simply not measuring the thing she is credited with doing. She could have typed not a single character and still designed the algorithm that played a key role. It's like trying to measure the input of an architect by how many bricks they laid in a building. Additionally, the project is broader in scope than simply implementing the algorithm credited to Dr. Bouman. Large amounts of code are involved in simply loading and co-ordinating files, displaying and saving images, and the like. All of which is necessary to the project at large but not specific to the algorithm used. 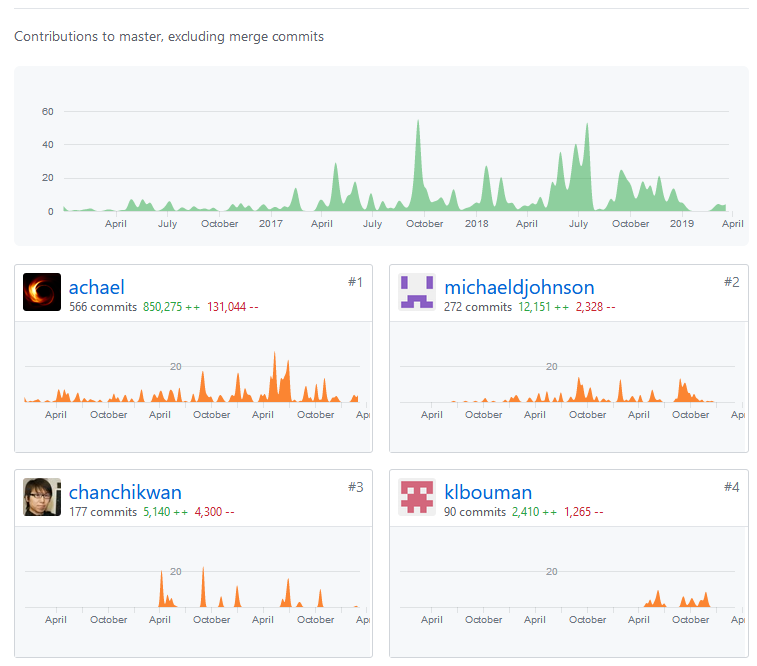 Finally and least importantly, the statistics in GitHub are not even measuring Lines of Code written - as claimed in the source - they are measuring lines changed in submission. Those lines can be code, or a change to a line, or a line copied between branches, even blank lines. In fact, (and, hat tip @Polygnome) the count includes lines which aren't even in the code at all, as there is also data and documentation included. Technically, that is the percentage of the code she contributed, 2410 lines in 90 commits. But that tells us nothing about what the code does. Andrew Chael, the man who is credited with doing the work in that article, has spoken up against the rhetoric used against her. "While I wrote much of the code for one of these pipelines, Katie was a huge contributor to the software; it would have never worked without her contributions and the work of many others who wrote code, debugged, and figured out how to use the code on challenging EHT data. "With a few others, Katie also developed the imaging framework that rigorously tested all three codes and shaped the entire paper. "As a result, this is probably the most vetted image in the history of radio interferometry. I'm thrilled Katie is getting recognition for her work and that she's inspiring people as an example of women's leadership in STEM. Not the answer you're looking for? Browse other questions tagged computers astronomy . Was the QWERTY keyboard layout designed to slow down typists? Is the climber's head-lamp backstory for this long-exposure photo feasible? Is there a way to tell if the sun is rising or setting by looking at a picture and not knowing which coast it was taken at? Was the 30th of June the closest Venus and Jupiter have appeared since 2 B.C? Do pulses of lunar waves traverse across the moon? Was Sun's distance mentioned correctly in “Hanuman Chalisa”, the 16 th century poem? Did the Mayans believe the Earth was flat? Was the 2017 solar eclipse the most-observed in history?